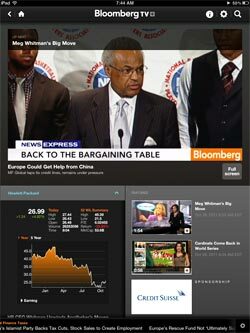 Bloomberg launches the “Bloomberg TV +” app for iPad on Thursday, bringing its live on-air video stream and on-demand content to the tablet. The free app drops the user into a rich selection of on-demand recent news clips, a directory to its recent shows and a button that feeds in the live cable channel content. The “Plus” in Bloomberg’s video app involves the supporting financial data and news links it attaches to most video clips. While each media piece streams in a marquee window, a column below lists each of the major companies and personalities mentioned, with drop-down access to current stock pricing, charts and related recent stories. Bloomberg TV + maintains an archive of recent shows, including more than a week of "Charlie Rose" interviews and feature programming like “Game Changers” and “Risk Takers.” The user can create playlists of video content for later reference, as well as share and comment on stories from within the app. The app is not just about video. Bloomberg also pulls in its text news stories. There is also the ever-present market ticker, which can be customized by the user. The app is supported by both pre-roll and static display ad units. Video ads were triggered at the start of many segments and the launch of the live TV feed. Square display ad units are woven into the carousel of featured stories that rotates beneath the large video viewing screen. Bloomberg TV + comes into the market weeks after rival brand "WSJ Live" also appeared on the iPad aggregating the increasing stream of video "WSJ" now generates. In Bloomberg’s case, of course, it is porting a live feed to the iPad -- something only a handful of cable providers have done, such as CNN. Unlike CNN, which requires authentication of a cable subscription, Bloomberg TV is making its cable channel content available to any iPad owner. Bloomberg has been marketing its TV channel more aggressively in recent months in an attempt to rival CNBC’s dominance in the financial TV market. CNBC "Real Time" is that brand’s iPad offering, which emphasizes news and market updates, in addition to a collection of on-demand clips posted shortly after they air. CNBC does not make a live feed available in the app.